Nothing feels the same as slipping into a pair of leather boots for a night on the town. The exact opposite is the feeling you get sliding on boots for the winter snow and slush mess outside. Boots come in many shapes and sizes. They are made for stylish events as well as a way to tame the outdoors. Are you thinking about purchasing a pair of boots? You could even check CHOIES to find some great deals! First, what type of boot are you looking for? Do you want a stylish addition to your shoe wear collection? Then choose from the many designer labels. Perhaps leather is what you are thinking with a nice high heel? Or, are you looking for a nice, durable pair of hiking boots? Planning that hiking trip and need a quality pair of boots that will protect you ankles and toes? Is the winter snow creeping up and you just know you're going to have to head on out there to shovel it up? You need a pair of durable, but waterproofed and warm boots then. Kids need the proper boots as well. They need boots that will tighten at the top to keep the snow out and the warmth in. There are so many more types of boots you might be considering. Consider this though. If you are looking to purchase a quality pair of boots, you may as well head on out to that busy mall to the shoe store. But, you don't have to! In fact, your favorite shoe may have a website to offer you. You can purchase your boots at home, online! Think of that convenience! As long as you know your size, there is no stopping you from finding the best boots for you on CHOIES from the convenience of your living room computer! Picking the perfect pair to fit your tastes and needs is easy if you are doing it online! Think of all those pushy salespeople you will avoid as well! 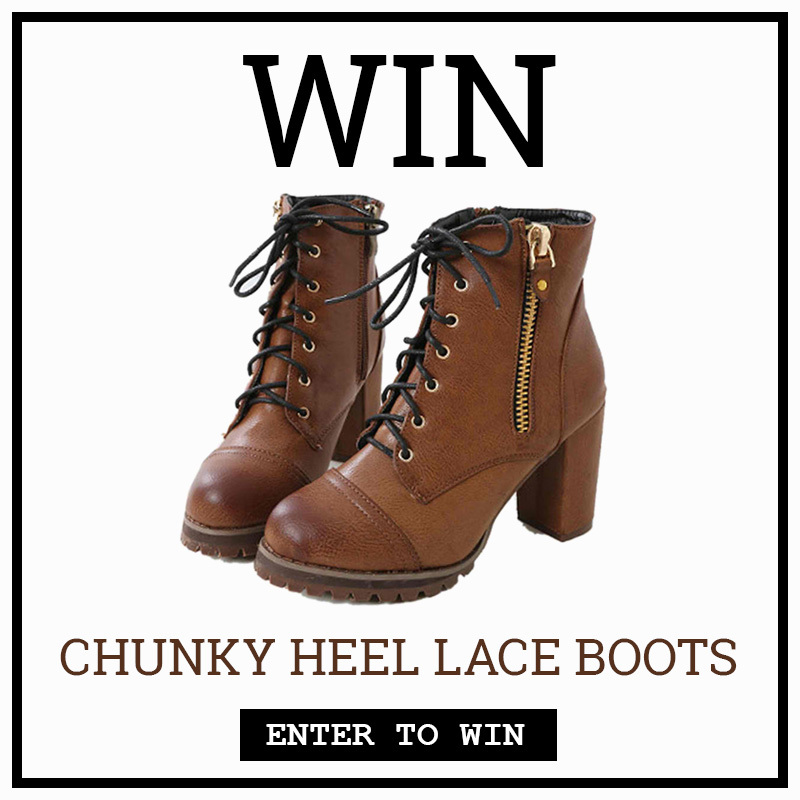 So for today's giveaway, one lucky reader will win a chunky heel lace boots worth $55.99! Just follow the giveaway widget below and be entered for a chance to win. This giveaway is open to all worldwide and will end on October 23, 2015, 11:59pm (Philippine time). I love this giveaway thank you! A girl can never have enough boots! These boots are perfect! Love the boots. They would be great for fall and winter. Great boots! Thanks for the giveaway! I've just now found this site. Love it! Great giveaways! I absolutely love these boots!!! Gorgeous Boots! Thanks for the giveaway! Fabulous style. Love the chunky heel! Oh I love the design of this boot. These are so cute, thank you for the giveaway! I like the black square lace up boots they're cute. I would wear this boots with a fringe vest and a fedora hat! Stylish for all seasons. I love these boots, super cute! Timeless, stylish quality boots I would be thrilled to have on my feet any day! Great Competition! i love these boots. they would be perfect for fall!